This product ships by the case only. 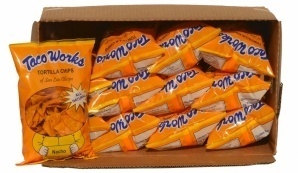 Twelve 6oz bags of Taco Works Tortilla Chips with our Nacho seasoning. Contains: corn, oil (coconut oil and/or corn oil and/or cottonseed oil), seasoning (Salt, Nonfat Dry Milk, Corn Flour, Romano, Cheddar & Parmesan Cheese Blend Cheeses (Pasteurized Milk, Cheese Cultures, Salt, Enzymes), Cultured Nonfat Milk, Partially Hydrogenated Soybean Oil, Whey, Sodium Citrate, Salt, Disodium Phosphate, Spices, Onion, Monosodium Glutamate, Buttermilk, Dextrose, Garlic, Tomato Powder, Sugar, Citric Acid, Disodium Inosinate & Guanylate, Extract of Paprika). Contains milk products.